As we previously discussed, BS 5534 is the revised British Standard for slating and tiling for pitched roofs and vertical tiling, which came into effect on the 31st August 2014. Fixing specifications are one of the main elements that have changed in this updated standard. Due to the adoption of Eurocodes for the calculation of wind loads, specifications have been upgraded to ensure roof coverings are fixed more securely. When it comes to roof tiles and slates, all single lap tiles must be either full fixed, all nailed, nailed and clipped in some area or nailed and clipped. There are also changes to slates and plain tiles too. More stringent fixing specifications will introduce an element of clipping on all roofs laid in single lap tiles. Clipping, in particular, is widely acknowledged as the most time consuming means of mechanical fixing and traditionally involves the use of either two-piece aluminium or stainless steel clips and nails. For all roof areas and pitches, every tile should be mechanically fixed with at least nails, clips, or a combination of these options that provide adequate combined resistance to the wind uplift loads on the tiles. 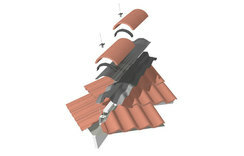 For roof pitches of 45° and above, each tile should be fixed with at least one nail. For pitches of 55o and above, including vertical, the tail of each tile should be mechanically fixed. For nibless tiles, two nails should be used to secure each tile. For nibbed tiles at roof pitches below 60°, two nails should be used to secure each tile in at least every fifth course. The fixing holes should normally be placed 20 to 25mm from the head of the slate, For roof pitches of 60° and above, including vertical, two nails should be used to fix every tile. Double-lap slates should have a minimum of two nails to every slate when centre nailed. Double-lap slates without nail holes should be fixed by hooks engaged on the centre of the tail of the slate. Special considerations may apply when they are used at pitches steeper than 70° and lower than 30°. Double-lap fibre cement slates should normally be secured with two nails and a copper disc rivet connecting the tail on the centreline of the slate to the two slates below through the gap between them. Wooden shingles and shakes should have a minimum of two nails or staples to every shingle or shake when centre-nailed. Special considerations may apply to other types of fixing. All mortar bedded components must be fully mechanically fixed and secured to the roof structure. The tensile strength of mortar bedding should not be taken in to account as part of wind uplift calculations.